Shipwreck US Gold coins, golden treasures from the S.S. New York, S.S. Republic, S.S. Central America, and S.S. Brother Jonathon. 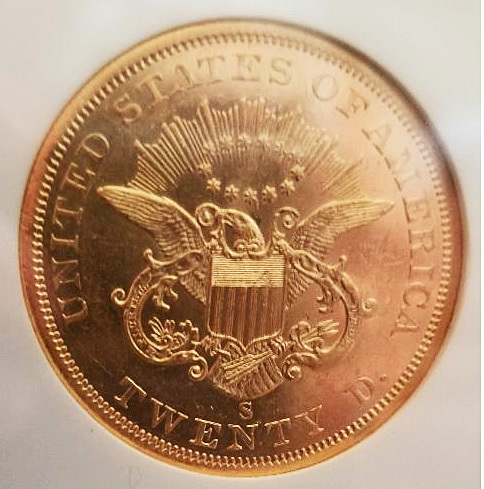 A San Francisco Double Eagle, rare in this currency shipment from New York to New Orleans in the immediate aftermath of the Civil War. Almost all of the SS Republic's gold was Philadelphia coinage, California shipments to New York having been interrupted by the war and the tragic loss of the SS Central America. Just three examples of the 1857 S $20 are listed on a recent inventory of the salvage of the SS Republic. A very choice double eagle without any high point wear, weakness, or distracting bag marks. Moderately prooflike fields. NGC for some reason called it a AU 58, which CAC promptly signaled was too low. But for the consequence of losing its original SS Republic insert, this would be an obvious upgrade. 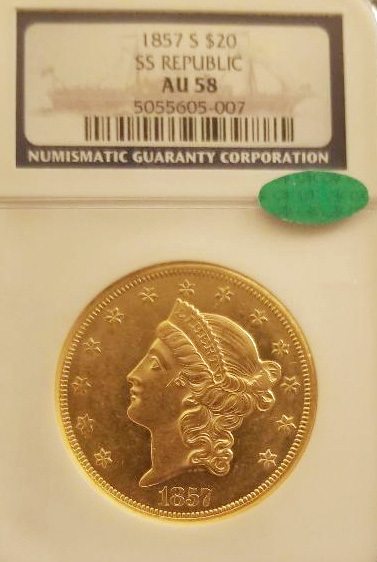 Grading aside, this is a very attractive San Francisco double eagle with a great Gold Rush and Civil War pedigree. 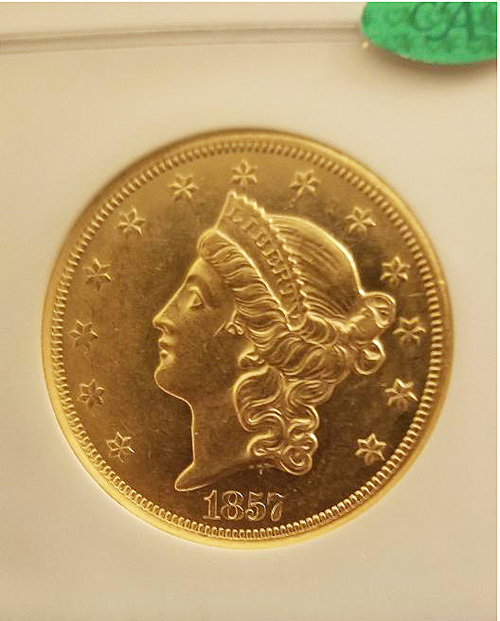 While the 1857 S $20 was a common coin on the Gold-Rush era manifest of the SS Central America sailing from California, eight years later and on the opposite coast, San Francisco gold had already become scarce due to intervening events. One of the post-war priorities of reconstruction was reviving banking and general commerce in New Orleans. The Union blockade especially in the final years of the war had severely depressed Southern commerce. New Orleans had lost its mint and most of is internationally connected banking despite Union occupation since 1862. Gold and silver coins and bullion fled the doomed Confederacy. The SS Republic was carrying about $400,000 in gold and silver to help revive New Orlean's commerce. The SS Republic lived 12 years and claimed no victims in its October 25, 1865 sinking. Christianed at Baltimore in 1853 as the SS Tennesee, the steam paddlewheeler had served eight years in Atlantic commerce, when in April 1861 she was seized In New Orleans by the Confederacy. Her service as the CSS Tennesee was short-lived, as she she was recaptured when New Orleans fell to the Union in 1862. Refitted as a gunship, she became Admiral Farragut's flag ship and fought at the battle of Mobile Bay. Retired from federal service in March 1865, she resumed service as a commerce vessel on the New York to New Orleans route, now with a new name, the SS Republic. On the fifth day of her fifth vovage she encountered a hurricane off Georgia, which proved too strong for her war-damaged hull. Her 100 passengers and crew successfully evacuated the ship. Several excellent books have appeared since the 2003 salvage of the SS Republic.The National Geographic Society also produced for PBS a film (which we recommend) entitled Civil War Gold.